2018 has been a great year for Winter Wilson. Their tour with folk-rock legends Fairport Convention was an outstanding success and their new album "Far Off on the Horizon" is their best selling to date. Now in their 6th year as full-time musicians, Kip Winter and Dave Wilson bring a sense of intimacy to every venue, blending superb, often hard-hitting original songs, stunning harmonies and musicianship with sometimes hilarious tales of life on the road. 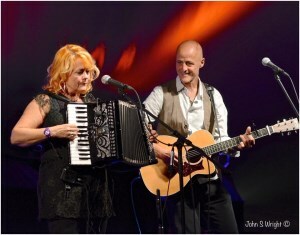 Kip (vocals, accordion, guitar, flute) "simply has a voice to die for” (John Roffey, Maverick Magazine), whilst Dave (vocals, guitar and banjo) is now rightly recognized as being amongst the top tier of British songwriters, with his songs covered by some of folk's "greats". Together, their voices are sublime. “In 30 years of listening to folk music, I have never heard two voices blend so perfectly.” (David Aird, Chairman, Glenfarg Folk Club) But it’s in live performance where these two really excel. Every show is different, but entertainment is key. That’s why so many clubs and festivals book them time and again. You will laugh; you may cry. You will certainly want to see them again! Winter Wilson Runners up in the best duo category (public vote) 2018 Folking.com Awards.